Joseph Kori and Judy Wangui: BY THE STANDARD: Detectives investigating the murder of business woman Mary Wambui are torn between charging a car hire services operator as an accomplice in the killing or turning him into a state witness after it emerged his testimony might hold the key to blowing open the case. This is after a forensic analysis of the phone of Wambui’s husband, Joseph Kori, as well as witness statements from people who have provided an alibi for him have made it diffcult for investigators to pin the murder on him. In his statement given to detectives from Directorate of Criminal Investigations (DCI) in Juja, Mr Kori who was initially thought by the police to have participated in his wife’s murder said he last talked to her at 4 pm on the day she was killed. He claimed that he hang up the call after his wife informed him that she was with Judy Wangui, believed to be Kori’s lover. He further told the police that he neither called his wife or lover after that brief phone call as he did not want to escalate what was already shaping up to be a day of drama between him and his wife. Kori has further claimed that he informed Wambui’s parents that she was not in the house on reaching home shortly before midnight on January 26. Additionally, it is said that people who were with him in Ngong on the night of the murder have corroborated his statement about his whereabouts. A source says that the police are even considering not charging him with Wambui’s murder if they don’t find any more compelling evidence by Wednesday when Kori and his mistress Judy Wangui will be taken back to court. 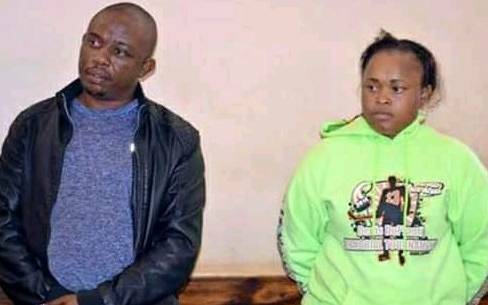 Kiambu Senior Principal Magistrate Stella Atambo allowed the police on January 30 to hold Kori and Wangui for two weeks as they carry out more investigations. But as it stands, Michael Mathenge, the tour company operator who was hired by Kori’s mistress Wangui to help dump Wambui’s body remains key to piecing the puzzles that led to the gruesome murder. However, Mathenge is said to be currently angling for a plea bargain, through which he hopes to avoid serving time in jail by becoming a state witness. One option the police are considering is to first charge him, and then enter into a bargain plea at a later stage. Further, a forensic analysis of mobile phone records has shown that Wambui had been in constant communication with her husband’s mistress which further confirms the allegation that they had indeed been friends. Interestingly, the phone records show that there had been no mean messages exchanged between the two women days leading to Wambui’s shocking murder. In her statement to detectives, Wangui who is reportedly uncooperative so far in the investigation process alleged that they (Wangui and Wambui) were drunk and got into an argument leading to a fight that caused Wambui’s death. Mathenge’s version of the events however dampened Wangui’s defence, after he said that she had earlier called him, telling him to look for a Toyota Noah and that she had a job for him on the day of the murder. This conficting version of events between Mathenge and Wangui has further deepened the puzzle on whether Wambui’s death was a pre meditated murder or not. But if indeed Wambui died due to injuries inflicted during a fight with her husband’s mistress then why did Wangui procure a Toyota Noah from Mathenge earlier in the day. Juja DCIO Obed Kioo said they are still looking for more items that were thrown away in order to conceal the murder. “The killer weapon has not been found yet same to a carpet from the main suspect’s house,” he said. “Investigations are still ongoing and we have not stopped pursuing the matter,” he said.